Our Wet Thermal Oxidation process was designed for growing thicker oxide layers while maintaining the same level of quality you would expect from Dry Thermal Oxidation. We specialize in growing thermal oxide for applications that require above standard film thickness. 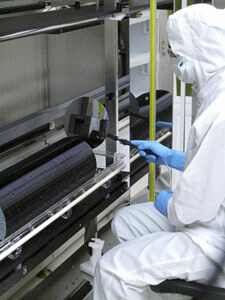 Wave guides technology and Silicon on Insulator wafers (SOI) can benefit greatly from our thick Thermal Oxide layers. We provide thermal oxide up to 15um in thickness. Thick Thermal Oxide is also widely used in the Chemical Mechanical Polishing (CMP) industry. Our 4um -6um Thermal Oxide on silicon wafers has been perfected as a consumable for breaking in CMP tools and polishing pads. These Silicon wafers can be reclaimed after use by stripping and re-growing the Thermal Oxide layer providing maximum material utilization. Our equipment is capable of large volume production, processing greater than 10 thousand wafers per month. Great quality and lead-times are our focus. We can process wafers and have them back to you within seven days, helping to reduced cycle time while providing you quality thermal oxidation up to 15um in thickness. We also carry a wide selection of bare silicon wafers for your convenience.